are included in the lower part of the mark. Much lighter than its dark Georgian counterpart "Willow" it reflected the Victorian age. Staffordshire pottery had come of age and its products no longer needed to rely on copies of Chinese styles which "Willow" undoubtedly was; and with the spread of the railways throughout the United Kingdom this new romantic pattern proved to be far more popular. With the Industrial age now dawned ordinary people gained access to what had been the preserve of the wealthy and what they wanted was a pattern that was clean light and above all affordable. "Asiatic Pheasants" took pride of place on the kitchen dresser, the cleanness and lightness of the pattern setting off the oak and mahogany and covering the rude pine boarding of the rack. The body of most "Asiatic Pheasants" dinnerware was commonly earthenware and the sheer volume of demand led inevitably to a general loss of quality in both the potting and the printing. This, of course, was not entirely so and good examples were produced in the late C19th and early C20th but they rarely match the quality and fineness of the earlier pieces. There is some difficulty in identifying the originator of the pattern, but the first producers were Podmore Walker & Co, who opened for business at Swan Bank in 1834 [ see entry for Podmore Walker & Co ] and were joined by Enoch Wedgwood in 1854. 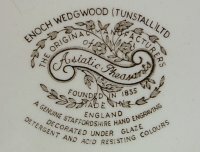 "Enoch Wedgwood (b.1813 d.1879) - a distant relation of Josiah Wedgwood I, became a partner in the firm of Podmore, Walker & Co, who rented the three potworks in Tunstall. Later he took his younger brother, Jabez into partnership and traded as E. Wedgwood & Co."
New Patterns were produced as Podmore, Walker & Wedgwood with older patterns being produced with the old backstamp marks. 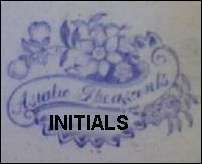 Whether Podmore Walker & Co ever wholly owned the "Asiatic Pheasants" pattern is doubtful, the backstamp mark associated with the pattern is not typical of the Podmore Walker partnership and even before the renaming of the company in 1860 other manufacturers were using the pattern and not necessarily under license. Co-operation between Pottery firms was not uncommon, patterns were known to be loaned and when large orders came in they were frequently sub-contracted to firms with spare capacity, even competitors to meet the demand. Piracy, however, was also not unusual, and the transfer printers, who were separate business' in their own right, would often sell their wares to more than one Pottery, and were not averse to copying a pattern or two if there was profit in it. 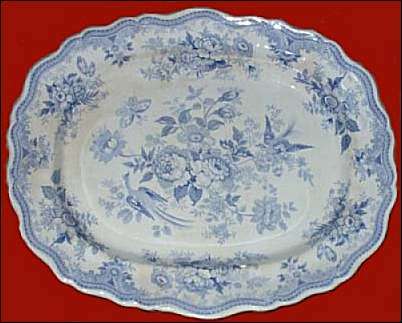 The Copyright Act of 1842 was intended to control this, but it would certainly be true to say that when Podmore Walker & Co. became Wedgwood & Co in 1860 the "Asiatic Pheasants" pattern was not their sole preserve and subsequently the list of companies using the pattern has grown considerably. The list of marks associated with the pattern is nearly 50, and is by no means exhaustive. Body shapes changed as the feathered or gadrooned edged pieces made way for the cheaper Oblong shapes and several potters found markets in North America for versions in Black, Red, Brown, Purple and Mulberry. note the claim to be "original manufacturers" & "founded in 1835" - many manufacturers like to trace their linage back to the original works - even though there may have been many changes in name and location. Enoch Wedgwood (Tunstall) Ltd operated 1965 to 1980. The Staffordshire town most associated with the pattern is Tunstall where the pattern was in continuous production from about 1838 to 1939 by several pottery firms at a number of locations, including the Well Street, Swan Bank, Unicorn and Pinnox works. Outside Staffordshire the pattern is known to have been copied by a number of potteries along the Clyde in Scotland, the Tyne and Tees in Northumberland, in Yorkshire, London , Devon and South Wales. Difficulties come in dating pieces largely because the pattern was principally produced for the domestic market and not the heavily protectionist American market which required the country of origin to be included in the mark after 1882. Goods not destined for export did not need the ENGLAND mark to be included. Consequent to this many antique dealers assume that all "Asiatic Pheasant" wares are earlier than 1882 whereas the greater part of the survivals are C20th and Georgian attributions for C20th pieces is not uncommon, even amongst highly respected dealers. As a reflection of the enduring popularity of the pattern there remain two producers in Staffordshire still producing variations of the pattern. Burgess & Leigh (now Burgess, Dorling & Leigh) remain more faithful to the original but the Wedgwood Group continue to produce a darker form under the Unicorn Pottery label. It is a shame that they cannot reproduce the quality and charm of the original 1840's pattern, in either the potting or the transfer print.